This article is about mechanical gears. For other uses, see Gear (disambiguation). For the gear-like device used to drive a roller chain, see Sprocket. "Geared" redirects here. For the video game, see Geared (video game). Two meshing gears transmitting rotational motion. Note that the smaller gear is rotating faster. Since the larger gear is rotating less quickly, its torque is proportionally greater. One subtlety of this particular arrangement is that the linear speed at the pitch diameter is the same on both gears. A gear or cogwheel is a rotating machine part having cut teeth, or in the case of a cogwheel, inserted teeth (called cogs), which mesh with another toothed part to transmit torque. Geared devices can change the speed, torque, and direction of a power source. Gears almost always produce a change in torque, creating a mechanical advantage, through their gear ratio, and thus may be considered a simple machine. The teeth on the two meshing gears all have the same shape. Two or more meshing gears, working in a sequence, are called a gear train or a transmission. A gear can mesh with a linear toothed part, called a rack, producing translation instead of rotation. The gears in a transmission are analogous to the wheels in a crossed, belt pulley system. An advantage of gears is that the teeth of a gear prevent slippage. In transmissions with multiple gear ratios—such as bicycles, motorcycles, and cars—the term "gear" as in "first gear" refers to a gear ratio rather than an actual physical gear. The term describes similar devices, even when the gear ratio is continuous rather than discrete, or when the device does not actually contain gears, as in a continuously variable transmission. Early examples of gears date from the 4th century BC in China (Zhan Guo times – Late East Zhou dynasty), which have been preserved at the Luoyang Museum of Henan Province, China. The earliest preserved gears in Europe were found in the Antikythera mechanism, an example of a very early and intricate geared device, designed to calculate astronomical positions. Its time of construction is now estimated between 150 and 100 BC. Gears appear in works connected to Hero of Alexandria, in Roman Egypt circa AD 50, but can be traced back to the mechanics of the Alexandrian school in 3rd-century BC Ptolemaic Egypt, and were greatly developed by the Greek polymath Archimedes (287–212 BC). The segmental gear, which receives/communicates reciprocating motion from/to a cogwheel, consisting of a sector of a circular gear/ring having cogs on the periphery, was invented by Arab engineer Al-Jazari in 1206. The worm gear was invented in the Indian subcontinent, for use in roller cotton gins, some time during the 13th–14th centuries. Differential gears may have been used in some of the Chinese south-pointing chariots, but the first verifiable use of differential gears was by the British clock maker Joseph Williamson in 1720. Ma Jun (c. 200–265 AD) used gears as part of a south-pointing chariot. Al-Jazari (c. 1206) invented the segmental gear as part of a water-lifting device. The worm gear was invented as part of a roller cotton gin in the Indian subcontinent (c. 13th–14th centuries). The 1386 Salisbury cathedral clock may be the world's oldest still working geared mechanical clock. The definite ratio that teeth give gears provides an advantage over other drives (such as traction drives and V-belts) in precision machines such as watches that depend upon an exact velocity ratio. In cases where driver and follower are proximal, gears also have an advantage over other drives in the reduced number of parts required. The downside is that gears are more expensive to manufacture and their lubrication requirements may impose a higher operating cost per hour. is the helix angle for the gear. The crossed configuration is less mechanically sound because there is only a point contact between the gears, whereas in the parallel configuration there is a line contact. Double helical gears overcome the problem of axial thrust presented by single helical gears by using a double set of teeth, slanted in opposite directions. A double helical gear can be thought of as two mirrored helical gears mounted closely together on a common axle. This arrangement cancels out the net axial thrust, since each half of the gear thrusts in the opposite direction, resulting in a net axial force of zero. This arrangement can also remove the need for thrust bearings. However, double helical gears are more difficult to manufacture due to their more complicated shape. Herringbone gears are a special type of helical gears. They do not have a groove in the middle like some other double helical gears do; the two mirrored helical gears are joined together so that their teeth form a V shape. This can also be applied to bevel gears, as in the final drive of the Citroën Type A. For both possible rotational directions, there exist two possible arrangements for the oppositely-oriented helical gears or gear faces. One arrangement is called stable, and the other unstable. In a stable arrangement, the helical gear faces are oriented so that each axial force is directed toward the center of the gear. 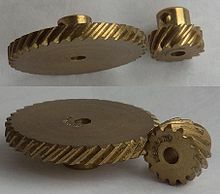 In an unstable arrangement, both axial forces are directed away from the center of the gear. In either arrangement, the total (or net) axial force on each gear is zero when the gears are aligned correctly. If the gears become misaligned in the axial direction, the unstable arrangement generates a net force that may lead to disassembly of the gear train, while the stable arrangement generates a net corrective force. If the direction of rotation is reversed, the direction of the axial thrusts is also reversed, so a stable configuration becomes unstable, and conversely. Worm-and-gear sets that do lock are called self locking, which can be used to advantage, as when it is desired to set the position of a mechanism by turning the worm and then have the mechanism hold that position. An example is the machine head found on some types of stringed instruments. A harmonic gear or strain wave gear is a specialized gearing mechanism often used in industrial motion control, robotics and aerospace for its advantages over traditional gearing systems, including lack of backlash, compactness and high gear ratios. A cage gear, also called a lantern gear or lantern pinion, has cylindrical rods for teeth, parallel to the axle and arranged in a circle around it, much as the bars on a round bird cage or lantern. The assembly is held together by disks at each end, into which the tooth rods and axle are set. Cage gears are more efficient than solid pinions, and dirt can fall through the rods rather than becoming trapped and increasing wear. They can be constructed with very simple tools as the teeth are not formed by cutting or milling, but rather by drilling holes and inserting rods. Measured in rotation over time, such as revolutions per minute (RPM or rpm). Measured in radians/second. 1 RPM = 2π rad/minute = π/30 rad/second. where a is the axis distance, z1 and z2 are the number of cogs (teeth) for each of the two wheels (gears). These numbers (or at least one of them) is often chosen among primes to create an even contact between every cog of both wheels, and thereby avoid unnecessary wear and damage. An even uniform gear wear is achieved by ensuring the tooth counts of the two gears meshing together are relatively prime to each other; this occurs when the greatest common divisor (GCD) of each gear tooth count equals 1, e.g. GCD(16,25)=1; if a 1:1 gear ratio is desired a relatively prime gear may be inserted in between the two gears; this maintains the 1:1 ratio but reverses the gear direction; a second relatively prime gear could also be inserted to restore the original rotational direction while maintaining uniform wear with all 4 gears in this case. Mechanical engineers, at least in continental Europe, usually use the module instead of circular pitch. The module, just like the circular pitch, can be used for all types of cogs, not just evolvent based straight cogs. Distance between the root circle of a gear and the addendum circle of its mate. The number of angular pitches through which a tooth surface rotates from the beginning to the end of contact. In a simple way, it can be defined as a measure of the average number of teeth in contact during the period during which a tooth comes and goes out of contact with the mating gear. In an involute gear, the pitch is on the base circle or along the line of action. Corresponding sides of involute gear teeth are parallel curves, and the base pitch is the constant and fundamental distance between them along a common normal in a transverse plane. For situations that require precision, such as instrumentation and control, backlash can be minimised through one of several techniques. For instance, the gear can be split along a plane perpendicular to the axis, one half fixed to the shaft in the usual manner, the other half placed alongside it, free to rotate about the shaft, but with springs between the two halves providing relative torque between them, so that one achieves, in effect, a single gear with expanding teeth. Another method involves tapering the teeth in the axial direction and letting the gear slide in the axial direction to take up slack. As mentioned near the beginning of the article, the attainment of a nonfluctuating velocity ratio is dependent on the profile of the teeth. Friction and wear between two gears is also dependent on the tooth profile. There are a great many tooth profiles that provide constant velocity ratios. In many cases, given an arbitrary tooth shape, it is possible to develop a tooth profile for the mating gear that provides a constant velocity ratio. However, two constant velocity tooth profiles are the most commonly used in modern times: the cycloid and the involute. The cycloid was more common until the late 1800s. Since then, the involute has largely superseded it, particularly in drive train applications. The cycloid is in some ways the more interesting and flexible shape; however the involute has two advantages: it is easier to manufacture, and it permits the center-to-center spacing of the gears to vary over some range without ruining the constancy of the velocity ratio. Cycloidal gears only work properly if the center spacing is exactly right. Cycloidal gears are still used in mechanical clocks. Numerous nonferrous alloys, cast irons, powder-metallurgy and plastics are used in the manufacture of gears. However, steels are most commonly used because of their high strength-to-weight ratio and low cost. Plastic is commonly used where cost or weight is a concern. A properly designed plastic gear can replace steel in many cases because it has many desirable properties, including dirt tolerance, low speed meshing, the ability to "skip" quite well and the ability to be made with materials that don't need additional lubrication. Manufacturers have used plastic gears to reduce costs in consumer items including copy machines, optical storage devices, cheap dynamos, consumer audio equipment, servo motors, and printers. Another advantage of the use of plastics, formerly (such as in the 1980s), was the reduction of repair costs for certain expensive machines. 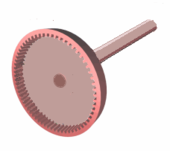 In cases of severe jamming (as of the paper in a printer), the plastic gear teeth would be torn free of their substrate, allowing the drive mechanism to then spin freely (instead of damaging itself by straining against the jam). This use of "sacrificial" gear teeth avoided destroying the much more expensive motor and related parts. This method has been superseded, in more recent designs, by the use of clutches and torque- or current-limited motors. Although gears can be made with any pitch, for convenience and interchangeability standard pitches are frequently used. Pitch is a property associated with linear dimensions and so differs whether the standard values are in the imperial (inch) or metric systems. Using inch measurements, standard diametral pitch values with units of "per inch" are chosen; the diametral pitch is the number of teeth on a gear of one inch pitch diameter. Common standard values for spur gears are 3, 4, 5, 6, 8, 10, 12, 16, 20, 24, 32, 48, 64, 72, 80, 96, 100, 120, and 200. Certain standard pitches such as 1/10 and 1/20 in inch measurements, which mesh with linear rack, are actually (linear) circular pitch values with units of "inches"
As of 2014, an estimated 80% of all gearing produced worldwide is produced by net shape molding. Molded gearing is usually either powder metallurgy or plastic. Many gears are done when they leave the mold (including injection molded plastic and die cast metal gears), but powdered metal gears require sintering and sand castings or investment castings require gear cutting or other machining to finish them. 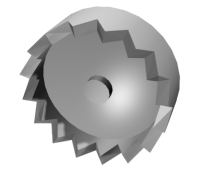 The most common form of gear cutting is hobbing, but gear shaping, milling, and broaching also exist. 3D printing as a production method is expanding rapidly. For metal gears in the transmissions of cars and trucks, the teeth are heat treated to make them hard and more wear resistant while leaving the core soft and tough. For large gears that are prone to warp, a quench press is used. Modern physics adopted the gear model in different ways. In the nineteenth century, James Clerk Maxwell developed a model of electromagnetism in which magnetic field lines were rotating tubes of incompressible fluid. Maxwell used a gear wheel and called it an "idle wheel" to explain the electric current as a rotation of particles in opposite directions to that of the rotating field lines. The gear mechanism was previously considered exclusively artificial, but in 2013, scientists from the University of Cambridge announced their discovery that the juvenile form of a common insect Issus (species Issus coleoptratus), found in many European gardens, has a gear-like mechanism in its hind legs. Each leg has a 400 micrometer strip, pitch radius 200 micrometers, with 12 fully interlocking spur-type gear teeth, including filleted curves at the base of each tooth to reduce the risk of shearing. The joint rotates like mechanical gears and synchronizes Issus's legs when it jumps to within 30 microseconds, preventing yaw rotation. ^ "Definition of GEAR". www.merriam-webster.com. Retrieved 20 September 2018. ^ Lewis, M. J. T. (1993). "Gearing in the Ancient World". Endeavour. 17 (3): 110–115. doi:10.1016/0160-9327(93)90099-O. ^ "Segment gear". thefreedictionary.com. Retrieved 20 September 2018. ^ "How Gears Work". howstuffworks.com. 16 November 2000. Retrieved 20 September 2018. ^ Schunck, Richard, "Minimizing gearbox noise inside and outside the box", Motion System Design. ^ a b Helical gears, archived from the original on 26 June 2009, retrieved 15 June 2009. ^ McGraw-Hill 2007, p. 742. ^ Canfield, Stephen (1997), "Gear Types", Dynamics of Machinery, Tennessee Tech University, Department of Mechanical Engineering, ME 362 lecture notes, archived from the original on 29 August 2008. ^ Hilbert, David; Cohn-Vossen, Stephan (1952), Geometry and the Imagination (2nd ed. ), New York: Chelsea, p. 287, ISBN 978-0-8284-1087-8. ^ a b McGraw-Hill 2007, p. 743. ^ Vallance & Doughtie 1964, p. 287. ^ Vallance & Doughtie 1964, pp. 280, 296. ^ Vallance & Doughtie 1964, p. 290. ^ Kravchenko A.I., Bovda A.M. Gear with magnetic couple. Pat. of Ukraine N. 56700 – Bul. N. 2, 2011 – F16H 49/00. ^ Hogan, C. Michael; Latshaw, Gary L. (21–23 May 1973). The Relationship Between Highway Planning and Urban Noise. Proceedings of the ASCE, Urban Transportation Division Specialty Conference. Chicago, Illinois: American Society of Civil Engineers, Urban Transportation Division. ^ Smith, Zan (2000), "Plastic gears are more reliable when engineers account for material properties and manufacturing processes during design. ", Motion System Design. ^ a b "W. M. Berg Gear Reference Guide" (PDF). Archived from the original (PDF) on 21 April 2015. ^ Oberg, E.; Jones, F. D.; Horton, H. L.; Ryffell, H. H. (2000), Machinery's Handbook (26th ed. ), Industrial Press, p. 2649, ISBN 978-0-8311-2666-7. ^ "Elements of metric gear technology" (PDF). ^ Fred Eberle (August 2014). "Materials Matter". Gear Solutions: 22. ^ Siegel, Daniel M. (1991). Innovation in Maxwell's Electromagnetic Theory: Molecular Vortices, Displacement Current, and Light. University of Chicago Press. ISBN 978-0521353656. ^ MacKinnon, Angus (2002). "Quantum Gears: A Simple Mechanical System in the Quantum Regime". Nanotechnology. 13 (5): 678–681. arXiv:cond-mat/0205647. Bibcode:2002Nanot..13..678M. doi:10.1088/0957-4484/13/5/328. ^ Sanduk, M. I. (2007). "Does the Three Wave Hypothesis Imply Hidden Structure?" (PDF). Apeiron. 14 (2): 113–125. Bibcode:2007Apei...14..113S. ^ Robertson, Adi (September 12, 2013). "The first-ever naturally occurring gears are found on an insect's legs". The Verge. Retrieved September 14, 2013. ^ Functioning 'mechanical gears' seen in nature for the first time, Cambridge University, 2013. ^ Burrows, Malcolm; Sutton, Gregory (13 September 2013). "Interacting Gears Synchronize Propulsive Leg Movements in a Jumping Insect". Science. 341 (6151): 1254–1256. doi:10.1126/science.1240284. hdl:1983/69cf1502-217a-4dca-a0d3-f8b247794e92. PMID 24031019. McGraw-Hill (2007), McGraw-Hill Encyclopedia of Science and Technology (10th ed. ), McGraw-Hill Professional, ISBN 978-0-07-144143-8. Vallance, Alex; Doughtie, Venton Levy (1964), Design of machine members (4th ed. ), McGraw-Hill. Engineers Edge, Gear Design and Engineering Data. American Gear Manufacturers Association; American National Standards Institute (2005), Gear Nomenclature: Definitions of Terms with Symbols (ANSI/AGMA 1012-F90 ed. ), American Gear Manufacturers Association, ISBN 978-1-55589-846-5. Buckingham, Earle (1949), Analytical Mechanics of Gears, McGraw-Hill Book Co..
Coy, John J.; Townsend, Dennis P.; Zaretsky, Erwin V. (1985), Gearing (PDF), NASA Scientific and Technical Information Branch, NASA-RP-1152; AVSCOM Technical Report 84-C-15. Kravchenko A.I., Bovda A.M. Gear with magnetic couple. Pat. of Ukraine N. 56700 – Bul. N. 2, 2011 – F16H 49/00. Sclater, Neil. (2011). "Gears: devices, drives and mechanisms." Mechanisms and Mechanical Devices Sourcebook. 5th ed. New York: McGraw Hill. pp. 131–174. ISBN 9780071704427. Drawings and designs of various gearings. Wikimedia Commons has media related to Gears. Geararium. Museum of gears and toothed wheels A place of antique and vintage gears, sprockets, ratchets and other gear-related objects. "Wheels That Can't Slip." Popular Science, February 1945, pp. 120–125.